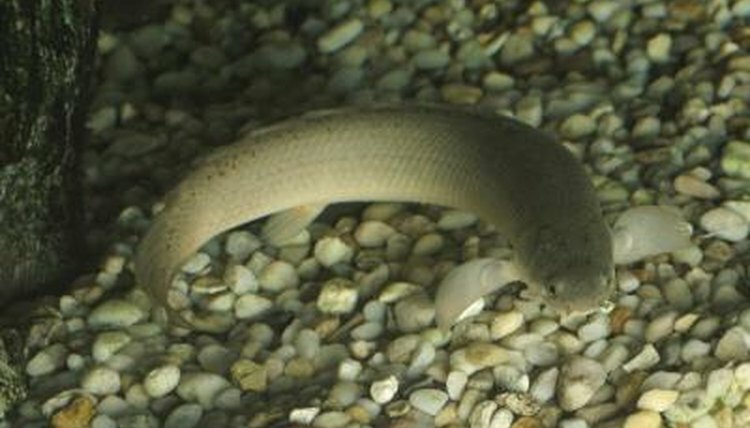 Fish have sensitive systems, and many can't handle much change in the water composition. Ammonia buildup in your aquarium can make your fish sick quickly, killing them in a matter of days if you don't address the problem. A variety of products exist to help you rid your aquarium of dangerous ammonia before your fish feel the effects too strongly. Ammonia occurs naturally in aquarium environments. Leftover, uneaten food decomposes and releases ammonia, and fish contribute to the problem as they discharge waste. This becomes more of a problem in overcrowded tanks, where existing filtration systems aren't adequate to process ammonia from waste. As the ammonia builds up, fish might exhibit red, inflamed gills, trouble breathing or lethargy, or they might gasp for air at the top of the tank. Using a test kit helps confirm the presence and amount of ammonia and the -- ideally, it should be zero, but it must be below 0.06 ppm for fish to survive. Many filtration systems already are designed to remove ammonia from your aquarium. They work in conjunction with helpful bacteria that often grows in your substrate. If your filter isn't doing the job, move up to filter inserts designed specifically for ammonia removal. These typically contain an ammonia-removing resin product and have large surface areas to encourage the growth of helpful bacteria. You also can add ammonia chips to your filtration system. In overcrowded tanks, you might need to upgrade to a larger filtration system for long-term ammonia removal. Water additives provide fast solutions to ammonia buildup, but they don't usually last long. Check the labels carefully, as many of these additives neutralize ammonia by turning it into ammonium instead of removing the ammonia altogether. This still will help your fish, at least for a couple of days, but it is likely to give you false readings when you test the water for ammonia -- the test kits often read ammonium as ammonia. These additives don't replace cleaning and filtration, but they can provide a short-term fix to save your fish. When you notice high ammonia levels, immediately perform a 25- to 50-percent water change in your tank, replacing the water with freshly dechlorinated water safe for aquarium use. This should be in addition to your regular partial water changes of up to 25 percent, which must be completed weekly, biweekly or monthly, depending on the size of your tank and the number of fish. A gravel vacuum helps you remove uneaten food and fish waste that settles among your substrate, so use this with every water change to help reduce ammonia buildup. Duke University: What Is Meant by "Cycling your Tank" and "New Tank Syndrome"?